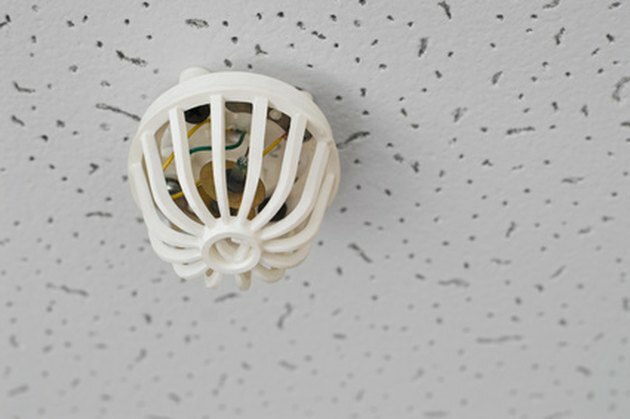 A carbon monoxide detector is one of the most important items in any home, so it's important to replace old detectors when they no longer function properly. But what do you do with the old detector? Carbon monoxide detectors do not contain any radioactive materials, making them much easier and safer to dispose of than regular fire detectors. Environmentally conscious consumers can follow these guidelines when getting rid of that old carbon monoxide detector. This carbon monoxide detector has a plastic casing that can be easily removed and recycled. The battery is the most hazardous part of a carbon monoxide detector. Remove the battery and take the necessary steps for properly discarding it. If it's an alkaline battery you can discard it with your normal trash, but be careful not to group batteries together when you throw them away. If the batteries touch they may become "live," which causes them to heat up and possibly leak. If your carbon monoxide detector has a rechargeable battery, make sure you dispose of it according to your local hazardous materials collection schedule. You can find your town's specific collection time at www.call2recycle.org. Many large chains, like Target and Lowe's, will gladly accept all used rechargeable batteries. Most carbon monoxide detectors have a plastic cover or face plate which can be recycled. With a flat-head screwdriver, gently pry the casing away from the body of the detector. Your detector may have other plastic parts. Be careful to properly identify the material before recycling it. Some parts have plastic "shielding" and can contain metals or non-recyclable materials. Once you've removed all batteries and recyclable casings, you can safely discard of the carbon monoxide detector with your normal trash.